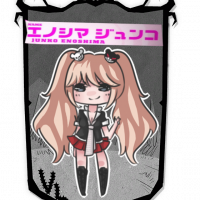 Enoshima Junko from Danganronpa GONNA DO DESPAIR! I love Danganronpa and Enoshima Junko! If u want this for DS Single Player, say it! I don't want a OP Character and i want to do this for ''classic players'' who still enjoy Don't Starve!! This is my first mod ever so...i think isn't nice but i'm happy with this! i goonna do it for all Don't Starve Modes, but first i need to finish the model 100% : Ghost,Faces,Interactions,Weapon etc..
Вау! Этот мод даже работает у меня, в отличие от многих других! Берите пример! Okay,here is a problem, when I try to active this mod, it just keep saying 'carshed last time'&'automaticlly disabled'.